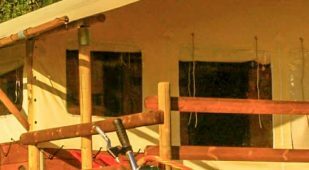 Our Cottages, Treehouses, Lodge Cabins, Gipsy Caravan, Safari Lodges and The Hut are equipped with a bathroom and toilet. 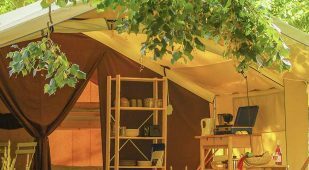 If you stay in Canadian Tent or an Amazon Tent, you’ll live like a camper (though better equipped!) and use the toilet blocks for the loo, showering and washing up. 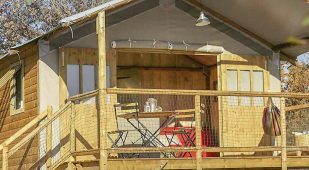 Guests really enjoy this type of accommodation – it’s an excellent compromise between the comfort of your unique rental and the convivial camping atmosphere. 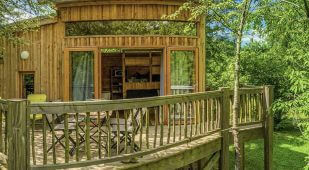 The Cottages, Tree houses, Lodge Cabins, Gispy Caravan, Safari Lodges, The Huts are equipped with bathrooms and toilets. When you stay in a Canadian tent or Amazon tent, you live like a well-equipped camper and use the sanitary blocks for your toilet and dishes. This formula is very appreciated, and an excellent compromise between your comfort in your atypical rental accommodation and the friendliness of the campsite. 10 of them are insulated. The other rental accommodations are lightweight, canvas lodgings that are not insulated. We can also provide a small space heater (oil stove). Contact us for more information.